"L'autorevole quotidiano NY Times ha pubblicato un interessante articolo sull origine e sull'attualità del lavoro dei nostri moleti negli USA. Il titolo è : "Venerable Craft, Modern Practitioner"�(Antico mestiere, moderno professionista). Robert Ambrosi sweeps into the restaurant kitchen, past sizzling chicken and buttery mashed potatoes, and goes straight for the knives � carving knives and chef’s knives, paring knives and fillet knives, all made dull by clashes with flesh and bone. He picks them up and replaces them with identical twins. “Any other knives here?” calls Mr. Ambrosi, a 54-year-old scion of a knife-sharpening clan that has spread from a valley in northern Italy to grindstones in cities across North America. Mr. Ambrosi runs Ambrosi Cutlery with his two sons, Mark, 29, and Jason, 26. Their system is typical of their trade: they rent double sets of knives to meatpackers, butchers, deli workers, restaurant cooks and chefs so that one set is always in use while the other is in the shop being sharpened. 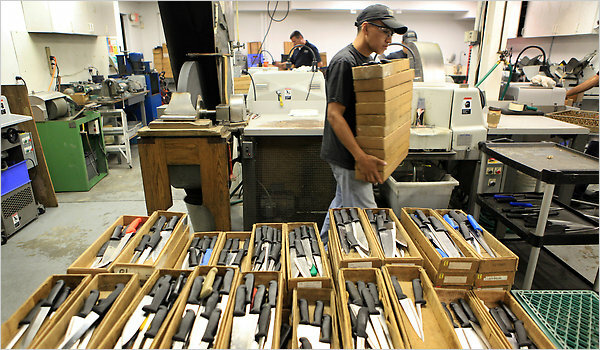 Every week, the company visits more than 800 clients and collects more than 8,000 knives to be replaced with freshly sharpened blades. The service costs $2.50 to $3.50 per knife. The business started servicing mainly butchers and meatpackers, in territories handed down from father to son. To preserve the business for his children, Mr. Ambrosi expanded it to restaurants and even Yankee Stadium, in some cases deviating from long-held tradition. Many cooks and chefs take personal pride in their knives and their ability to maintain them, and would hesitate to release them to anyone else’s care. But sharpening a knife takes time and skill � and not every chef has both. At the Meat Hook, a butcher shop in Williamsburg, Brooklyn, Mr. Ambrosi’s son Jason dropped off 13 newly sharpened knives, including an ebony-handled one with a carbon-steel blade and hand-hammered brass star-shaped rivets, produced decades ago by his great-grandfather’s company in upstate New York. “Those are beautiful knives,” said Tom Mylan, a butcher, who is so enamored of them he has photographed the vintage one for his Facebook page. It would be hard to find someone more concerned with the beauty of a blade than Mr. Ambrosi, whose hands show a fine crosshatch of cuts on top of old blisters and burns. 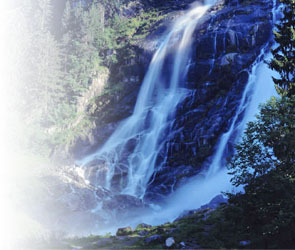 Most of those who do have it trace their roots to the mountains of northern Italy. Mr. Ambrosi’s grandfather, who came to the United States in the 1920s, hailed from the poor village of Carisolo. The village, with two neighboring towns of Pinzolo and Giustino, produced many of the more than 100 commercial knife sharpeners at work today in North America, sharpeners said. No one knows why so many of the children of these towns became sharpeners. Most learned the trade in the immigrant networks of the countries where they landed. But today in Pinzolo is a tribute, Monumento al Moleta, Monument to the Knife Sharpener. At first the immigrants came mainly to New York, but soon their offspring scattered to stake out new routes, a dozen sharpeners across the country said in interviews. Ambrosis with grindstones do business in Connecticut, New Jersey and Ohio, as well as boroughs of New York. The Binellis set up knife-sharpening businesses in Detroit, Chicago and Medford, Mass. ; the Maganzinis ended up in and around Boston. The Povinellis set up shop in Buffalo and ventured to North and South Carolina and Arizona; offshoots of the Nella family went to Toronto and Vancouver, as well as Long Island, Seattle and West Jordan, Utah. Robert Ambrosi’s grandfather traveled the Bronx in a horse-drawn cart with a grindstone powered by a foot pedal, serving, like the other knife sharpeners, mainly butchers and meatpackers. Mr. Ambrosi’s father used a grindstone fueled by a battery carried in a truck. The battery had to be plugged in each night in the garage to recharge. Then in the 1950s came the great innovation � double sets of knives � that eventually freed the Ambrosis to set up their first shop. Today the pickup and delivery truck is a Dodge Grand Caravan, from which one of the Ambrosis is likely to emerge, in the black polo shirt and jeans that are the uniform of Ambrosi Cutlery, with cardboard boxes of knives under one arm. At the Ambrosis’ spacious shop in Mahopac in Putnam County, the technology has changed little. Newer machines do the same thing as the older ones, only faster. Most knives go through a simple process. First the hollow grinder, which thins the knife. Then the honing machine. Higher-quality knives are sharpened on a grindstone, then buffed, then hand-honed on a stone that Mr. Ambrosi expects will last throughout his sons’ careers. At the grindstone with a knife, Mr. Ambrosi is slow, meditative, absolutely steady. Fingers stretch over the blade, wrist and hand lock over the handle of the knife. While sparks fly, the knife is still. He watches for light reflecting off the blade’s very edge � showing he has created a plane he calls a “fil mort,” or dead edge, necessary to sharpen the knife to its edge. Later he will hone the plane away by hand. While Mr. Ambrosi’s sharpening technique has changed little, his approach to the business has as he strives to preserve it for his sons. Once there were more than 100 companies in New York City; today, there are perhaps 50. That effort can clash with tradition. Some of the northern Italian knife sharpeners still function in the old style, as members of the New York Grinders Association. The rules used to be simple: Don’t mess with someone’s turf. Stick to your own route � the one you inherited from your father or grandfather. Avoid the vendettas that have overtaken sharpeners in other cities. “People will trade stops,” said Rinaldo Beltrami, the association’s president. Yet his sons have been knocking on doors to establish new routes, and Mr. Ambrosi has developed a Web site and a mail-order service, because his sons need enough business to sustain their future families, too. “Were they receptive? Were they nice to you?” Mr. Ambrosi asked his son Mark, who had just come from a meeting with a new restaurant. “Yeah, it went well,” Mark said, indicating he had won the restaurant’s business and smiling at his father.